From my point of view, it's still a ZAYIN. However, if in doubt, one is obliged to show it to a tinok. As we know in Ketav BY the zayins are three kulmosim and the Nun Peshuta no less than four kulmosim. This one is right in between. really I always understood that you cant ask a tinok when you have a shaloh of a long zayin because the nun in siddur is a long vov. the tinok will definitely read this as a zayin even though it may be problematic. Agreed. That's why you have to use a designated, groomed tinok, who is familiar with the fact that a nun pshutah and a zayin are the same on top, the only thing that differentiates them is the length of the regel. Please see Sefer Sefekot HaSofer, ZAYIN:13 - If the regel is shorter than 3 kulmosim and there is safek in how to read it, one must show it to a TINOK. Secondly since it's only maybe possibly a tad longer that what a zayin should be I'm pretty sure there's also a snif lehakel since it's at the beginning of the word and it's a peshuta. IMHO I think the "Boro Park chumroh" with regards to slightly long zayins is excessive. This is clearly a kosher zayin, not a nun. There are exactly two roshim in the regel, maybe even a fraction less. the shin as well as other letters come down a little lower as well. A tinok would certainly read it as a zayin. Furthermore it is at the start of the word, which is an extra tzad lehokil, not that I think its a problem anyway. Sorry, I mean it is approximately two roshim in the regel maybe a fraction MORE. But still no where near three. Kosher. Can and should be fixed. The Shin of Moshe is almost Pasul. The middle Regel touches the left Regel, barely missing having the basic Tzuras Shin of Shlosha Regalim together. Which - when that's true - is missing Tzuras Ha'Os and fixing would be SheLo KeSidran. Agreed. Aharon, what's the basis for your comment? 1)a nun has a regel of 3 kulmus. 2)a zayin has a regel of 2 kulmus. 4)darkei moshe siman 36 brings mordchai which should be looked up in back of meseces menuchos that although a nun was not made as long as it is supposed to be it is still a nun. 6) a tinok will read a zayin that has 3 kulmus as a zayin. OUTCOME: although lehalacha tinok should be used- unless you can get hold of Eli's designated tinok this option is out. 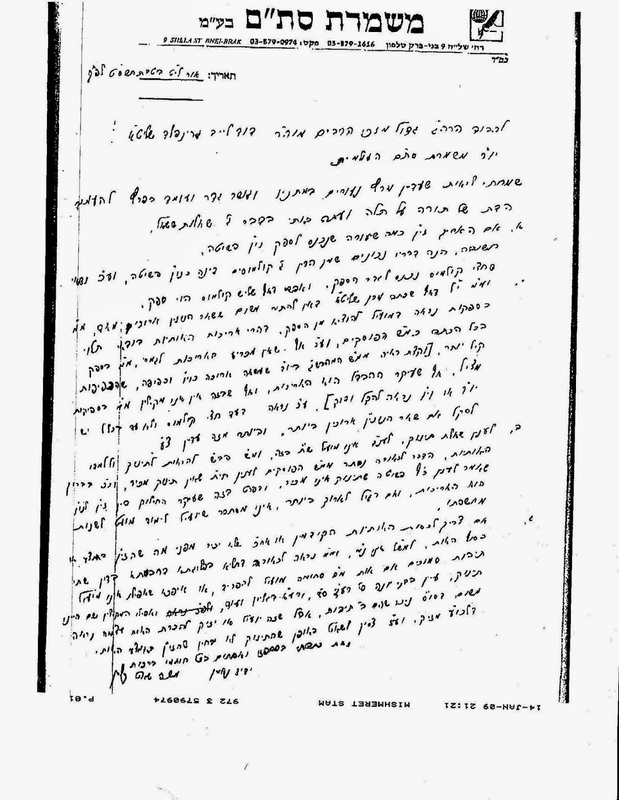 Rabbi Greenfeld points out that as long as zayin does not stick out below the line of most moshavim it is kosher since it is called ksiva arucha, however he points to Rabbi MS Klien in regards to how much longer is a problem.also since beraysa writes that sofer must be careful with long zayin we cannot compromise. 1- up to a half of a kulmus longer "velo ad bichlal" is kosher without tinok. 3.a zayin in beginning of word is different then bnei yona who allows mem stuma to be used when insufficient space between words. NOW IF I DON'T HAVE DESIGNATED TINOK AND ITS EXACTLY HALF KULMUS LONGER????? Furthermore although a nun with a regel of three kulmusim is kosher, ideally it should be 3.5 kulmusim. Could it be this is what the Mordechai meant? (I don't have it handy).